Reminder: “Let It Snow” Means Free HVAC Equipment If It Snows on Christmas! What’s a Merry Christmas Without a Warm Furnace? This is Olive, doing my End of November Check-In to make sure you know about our big “Let It Snow” promotion. Here’s the simple pitch: If it snows on Christmas this year, you get free HVAC equipment! 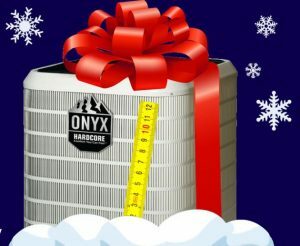 The longer pitch: If you purchase new HVAC equipment from us between now and December 20, 2018, and it snows more than two inches on Christmas Day (that’s as measured at McGhee Tyson Airport), then your purchase is free! That’s right, a total of zero dollars and zero cents, not a single dog biscuit! Now as we’re getting closer to the Big Day and you’re doing some heavy thinking about shopping—such as shopping for a new heater and air conditioner—you may want to know a bit more about the odds. The current weather forecast from WVLT in Knoxville is predicting a 15% chance of snow on Christmas. Of course, that could go up in the next few weeks. But a 15% chance of getting a free HVAC system are good odds. And there’s no downside, because no matter what, you end up with terrific new heating and cooling equipment to help see you through many years of comfort! If you want more information about “Let It Snow” or to schedule any heating service in Maryville, TN or elsewhere in our service area, reach out to us today! Schedule great comfort services with Russell & Abbott. Offering service in Blount, Knox, and Loudon Counties and the surrounding areas.